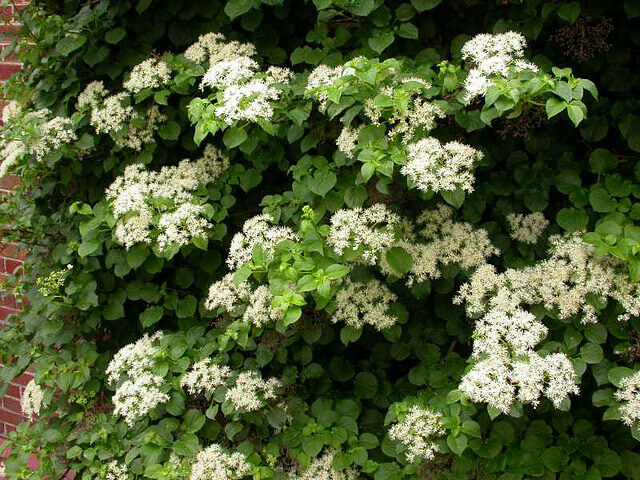 It’s music to the ears of homeowners who are plagued with shady spots: yes, there are, in fact, shrubs that grow in shade. 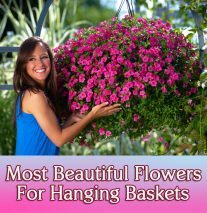 But which ones, specifically, should you plant? The answer to that question depends, in part, on what you wish to accomplish. 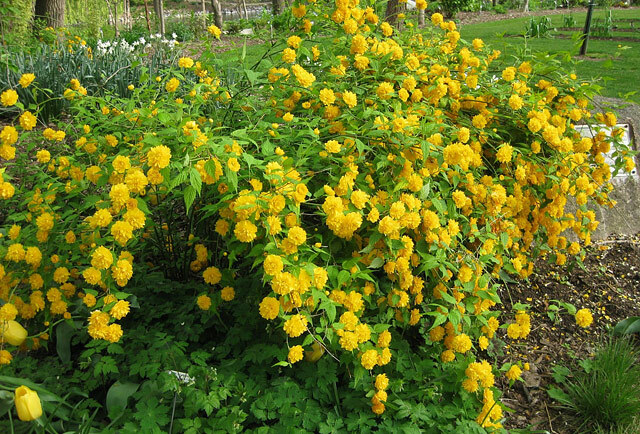 Consequently, the examples of shrubs that grow in shade presented below are a diverse lot. 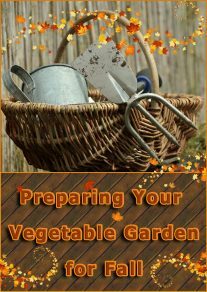 Depending on your particular landscaping needs, one of them may be just the bush you need to shine a little light upon a heretofore drab nook in your yard. But what do they have to offer in landscaping, perhaps you wonder? Well, for one thing, they sport glossy evergreen leaves. If that fact doesn’t win you over, I’ll add that they produce showy clusters of flowers in late spring. 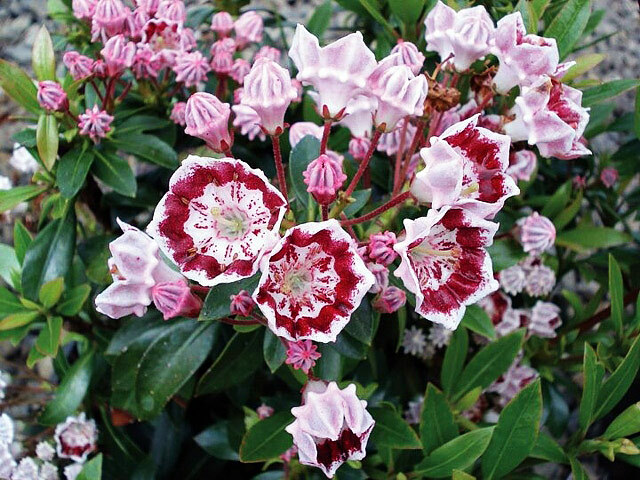 Finally, cultivars have been developed just for use in the landscape, including the dwarf ‘Minuet’ laurel, which I show in my picture here. The color of its flowers is more vibrant than that on wild mountain laurels. You see, there are many shrubs that grow in shade, in the sense that they won’t die for lack of sunlight there. But that’s not the point, is it? You want more than for a bush to survive, you want it to thrive. If it’s flowers you desire, you want a full display of blooms, not a sparse sprinkling here and there. That’s why Japanese rose made my list. It furnishes a good display of flowers in partial shade. But again, your choice will depend on what you want. If it’s fall-foliage color you crave, you may prefer arrowwood viburnums. As their name suggests, climbing hydrangeas (Hydrangea anomala ssp. petiolaris) are shade-tolerant vines, but I include them here because they can be trimmed so as to maintain them as if they were shrubs. While they tolerate shaded areas, they tend to yield better flowering displays when exposed to a reasonable amount of sunlight. Exfoliating bark provides winter interest. As with climbing hydrangeas (above), the blooming of ‘Carol Mackie’ daphne shrubs may be enhanced if the plants receive sufficient sunlight. 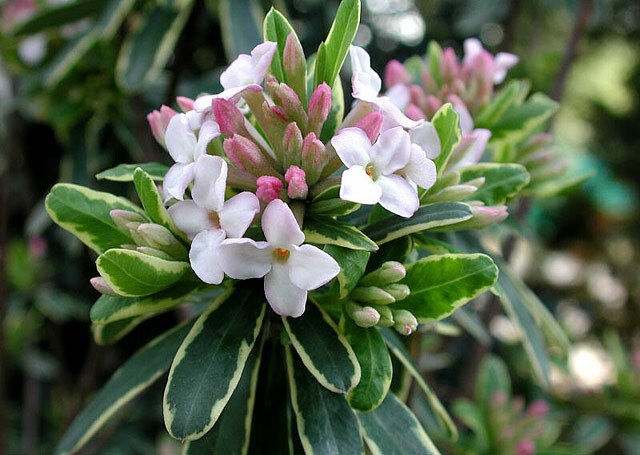 But this fact is hardly problematic, as these plants are worth growing for their variegated leaves, alone. Not that their flowering isn’t noteworthy. And I say this not so much regarding the appearance of their blossoms as regarding the smell. They are truly wonderfully aromatic. 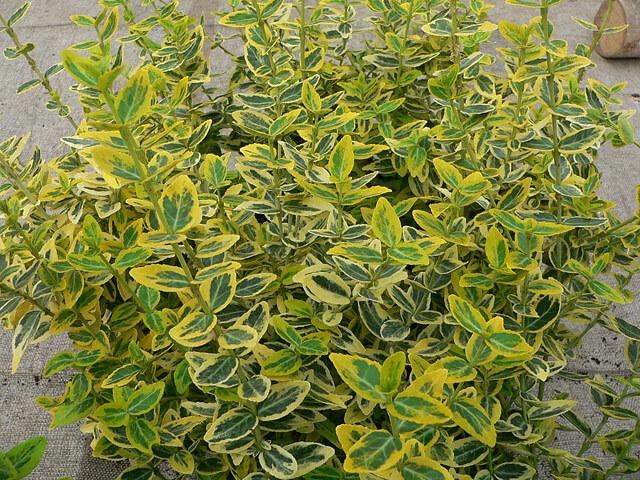 There are many kinds of euonymus. 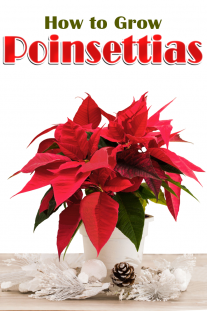 One is quite notorious as an invasive plant and is called, in common parlance, “burning bush.” While this is a shrub that grows in shade, lack of sufficient sunlight may rob it of its one selling point: its fall color. It was its resemblance to boxwood that spurred my initial interest in Hetz Japanese holly. 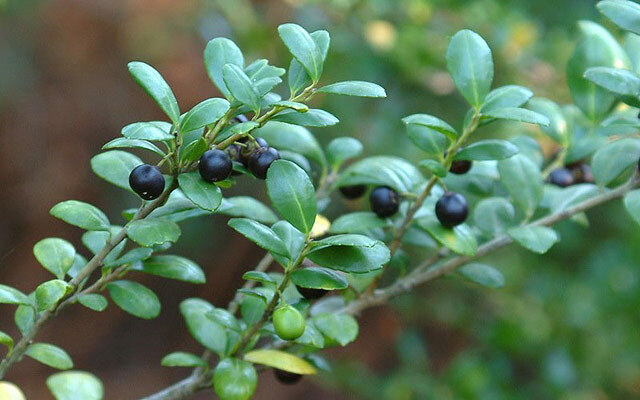 Unlike the hollies with which you may be more familiar, the berries on this type are black, not red. It’s not flowering displays, fall-foliage color, and two-toned leaves alone that catch our attention when we peruse people’s landscaping. Another component sure to stand out is any of the so-called “architectural” plants. ‘Sky Pencil’ holly is one such plant. You can’t miss this column-shaped bush. And once you’ve identified it, you’ll never forget it. Even the name is memorable, being highly descriptive. All the evergreen shrubs I’ve presented so far are classified as broadleaf types. 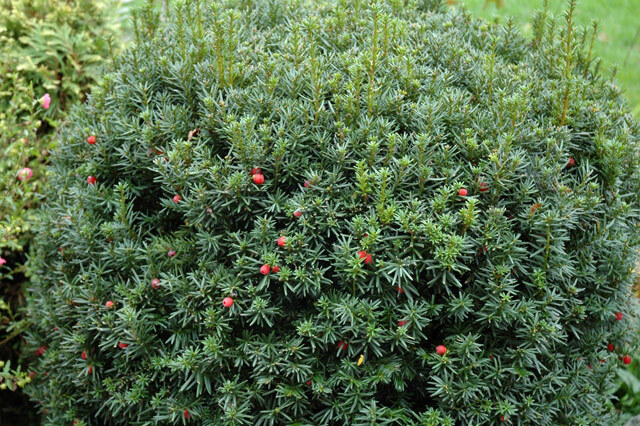 But with these last two entries, I move on to examples of needled evergreens. Hemlocks can be trimmed so as to promote development of dense foliage, making them great for privacy screens. 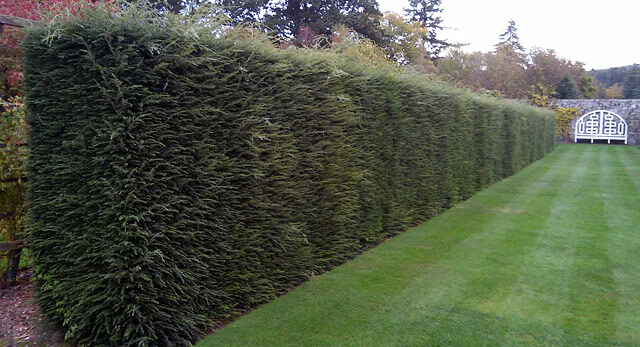 You may not be familiar with these cultivars, but I assure you that they make for terrific hedges. 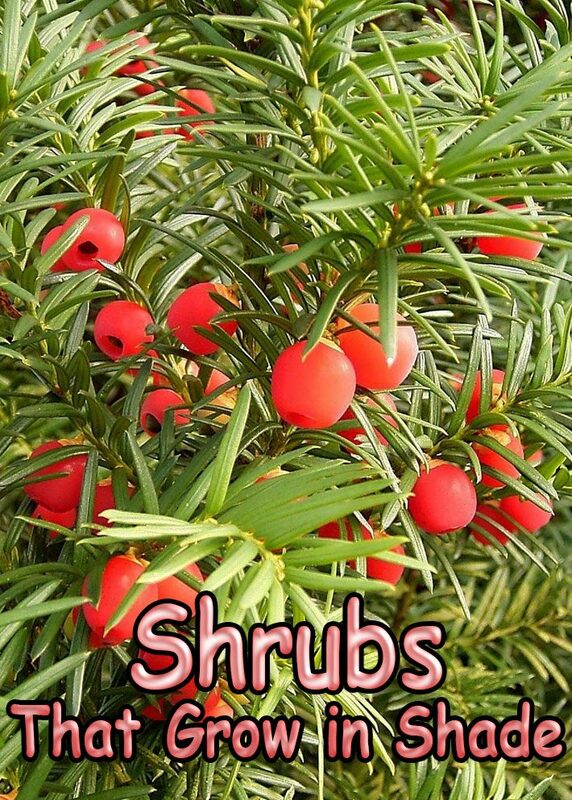 These needled evergreens are valued for their showy red berries and as shrubs that grow in shade. 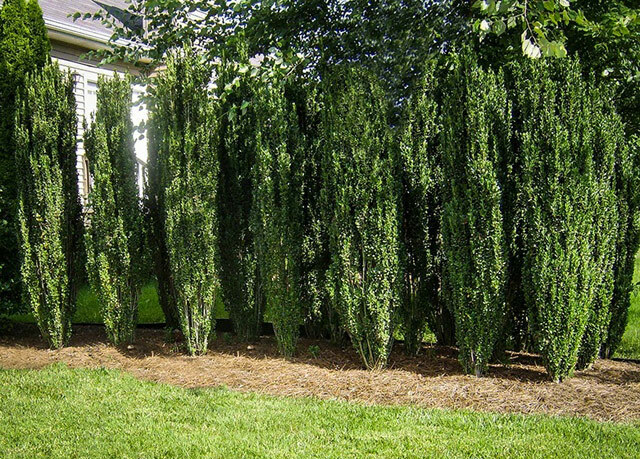 Some people find them boring or overused, but the versatility of these tough bushes makes their case for them. Common plants are common for a reason: don’t hold their popularity against them. 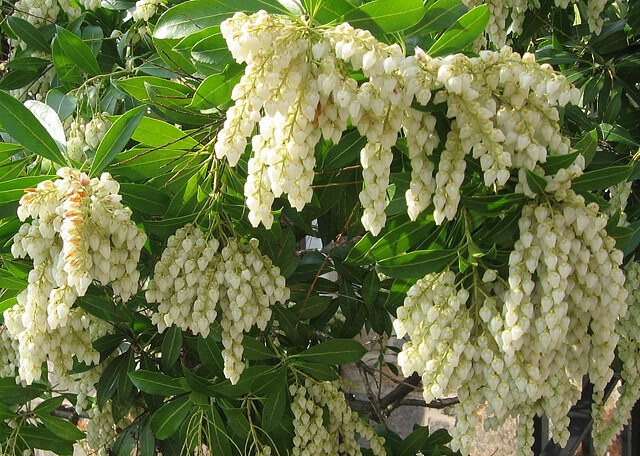 Andromeda shrubs (Pieris japonica) may offer something else, too: fragrant flowers. I say they “may” offer this feature, because whether you agree or not very much depends on your personal tastes. Some people find their smell offensive, while others find it pleasing. If you dislike strong flower aromas, you may land in the former group.